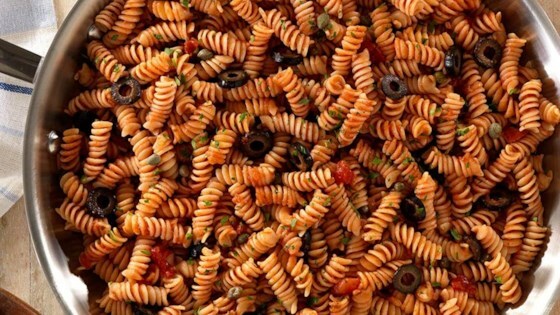 "Rotini pasta in a zesty marinara sauce with black olives and capers is a quick and delicious choice for a busy weeknight dinner." Pour whole box of pasta into a large skillet (approximately 12 inches in diameter). Pour 3 cups of cold water into the pan, ensuring that the water covers the pasta. Turn the burner to high, then set your timer for 10 minutes (optional: add a bit of salt to taste). Cook on high, stirring occasionally, until 1/2 of the liquid has evaporated. Add garlic and chili flakes, stir to combine. Continue to cook on high. With about 1 minute left add the sauce, olives and capers, season with salt and pepper. Remove the skillet from heat and top with parsley. Serve immediately. Really fast, really easy, really tasty! Except for the fresh parsley, which I keep growing by the back door, everything is a pantry item. Dinner was ready in a flash.